Samsung Galaxy Note 8.0 GT N5110 Wifi Ver. LCD Touch Screen Assembly White Color. 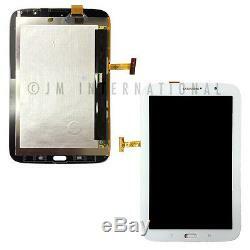 Samsung Galaxy Note 8.0 GT-N5110 LCD Touch Screen Assembly White Color Replacement part. High quality Replacement part for Samsung Galaxy Note 8.0. International and its products are by no means affiliated with Apple, Blackberry, Samsung, LG, HTC, Sony Ericsson, Nokia, Motorola, AT&T, Sprint, Tmobile, Verizon or any of its subsidiaries. Our parts are NOT refurbished, offered or authorized by its manufactures. We make no representations or warranties of any kind, express or implied, about the completeness, accuracy, reliability, suitability or availability with respect to the listing or the information, products, services, or related graphics contained on the listing for any purpose. We will not be held responsible for any misuse or misrepresentations of our products conducted by buyers. Work Time : Monday Friday (excluding holidays). Please notify us within 14 days. Return items must have all the original packaging and the accessories, especially the labels. Do not post negative or neutral feedback before contacting us. We will try our best to satisfy you! The item "Samsung Galaxy Note 8.0 GT N5110 LCD Touch Screen Assembly Glass Digitizer USA" is in sale since Friday, May 15, 2015. This item is in the category "Computers/Tablets & Networking\Tablet & eBook Reader Accs\Other Tablet & eBook Accs". The seller is "jminternationalinc" and is located in Skokie, Illinois. This item can be shipped worldwide.